The farmers’ market is held on the last Wednesday of each month where you will be able to buy great produce direct from the people who grow, rear or create it. 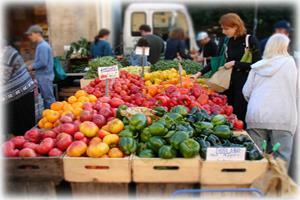 Wander the stalls to buy your fresh vegetables, local meats, cheeses, jams, pickles and lots more! Farm and locally produced quality produce. Lamb, beef, pork, vegetables, cakes, jams, preserves, puddings, fruit juice, cheese, dairy, eggs, bread, pastries, confectionery, olives, sea salt, herbs, plants (subject to availability). Free entry (usual charges apply for entry to the nature reserve trails).